We believe that every child is capable of learning and that there is a role in life for every one. Therefore, it is the intention of this school to help to prepare all children who come under our tutelage for their role in life by educating them to their fullest potential. The new school year started officially on 1st September, 2015. We spent the summer months ensuring that the plant and other aspects of the environment were in acceptable condition to meet the start of the new School Year. Our Grade 6 students did us proud. They are all in place in their new high schools. Our Grade 4 students, who sat the Grade Four Literacy Test in June, 2015 all gained Mastery and are now in preparation mode for the GSAT Exams. All our teachers are in place, and we have evaluated the book lists to ensure that only books that are absolutely necessary are recommended. We have been commended by the Ministry of Education, parents and the community for our achievements and the improved product quality. We appreciate the commendations and will continue to work hard to assist with the socialization and education of our children. Come visit us to see what we have to offer. Our environment ensures that every child can learn and every child will learn. CONGRATULATIONS TO ALL OUR LIGUANEA PREP. STUDENTS WHO SAT THE MINISTRY OF EDUCATION'S GRADE FOUR LITERACY AND NUMERACY TEST IN JUNE 2014. ALL FIFTEEN (15) STUDENTS WHO SAT THE EXAMINATIONS GAINED MASTERY. THESE RESULTS MEAN THAT ALL THESE STUDENTS ARE ELIGIBLE TO SIT THE GSAT EXAMINATIONS IN MARCH 2016. LIGUANEA PREP. CONTINUES TO BE ONE OF THE TOP PREP. SCHOOLS OF CHOICE IN JAMAICA. You may contact us through email at liguaneaprep@cwjamaica.com or Dr. Paulette Francis-McGregor at 990-1942 or Miss Judith South at 385-4802. We apologize for any inconveniences caused by this necessary closure. 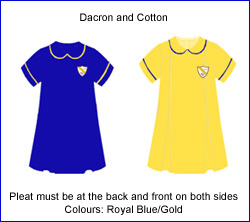 The girl's uniform will now be gold tunic piped with royal blue and royal blue uniform piped with gold with a peter pan collar made with Dacron and Cotton material. The uniforms can be purchased from MISS INGRID WILLIAMS AT INGRID'S BOUTIQUE, TELEPHONE 369-8146. Navy blue denim pants (long or short) with sky blue bush jacket. The uniforms can be purchased from ULTIMATE VISIONS, 10 SHORTWOOD ROAD, KINGSTON 8, TELEPHONE 969-1777.